Bluetooth wireless earbuds are the minimalistic approach to personal music, with just the two small earbuds (see previous post). But the small size means tradeoffs, including shorter battery life. If you are looking for other alternatives, Plantronics offers a wide range of listening products, both single-ear earpieces used mostly for phone calls, and stereo headsets and earbuds in a variety of styles - in the ear, over the ear, over the head, and behind the head -- and for use in the office and for travel. In particular, these Plantronics products are designed for extended music playback and can help you relax on long trips with extended listening times (8+ hours), voice assistant integration (Apple Siri or Hey Google), and built-in active noise-canceling (ANC). ANC provides clearer audio in high- and low-noise environments, especially by filtering out low frequency noises like AC, fans, motors, and buzzing electronics. The noise-canceling level can be controlled from the Plantronics Backbeat app, along with selecting balanced or bright EQ modes. For longer use in earbuds, the Plantronics BackBeat GO 410 Earbuds add a flexible neckband that sits behind your head, with cables running up to the two earbuds. This design provides the space for extended use -- up to 8 hours listening with ANC, and 10 hours without ANC. And it allows the use of additional electronics, especially the active noise-canceling and voice assistant integration. They also allow you to insert and remove the earbuds easily. When you remove them, they snap together magnetically to hang out of the way, which also turns off ANC and disconnects Bluetooth to save power. And unlatching them will automatically re-connect Bluetooth and answer an incoming call. The power cable also is dual-use - the USB charging tip pops off to convert the cable into a standard 3.5 mm audio connector, so you can still use the earbuds with a wired connection even if the battery is dead. The BackBeat GO 410 Earbuds are available for around $129, in black and white. Then, of course, the best way to isolate yourself on a long plane trip is to use over-the ear headphones, like the Plantronics BackBeat GO 810 Headphones. These are designed for commuters and travelers, with up to 22 hours of listening time with ANC, and 28 without ANC. They have a slim over-the-ear design with memory-foam padding, weigh only 7 ounces, and fold flat for travel. The earpieces have room for multiple controls, including volume, skip tracks, and take calls, plus manual controls including select EQ presets, ANC on/off, and activate voice assistants. The headphones support an extended range Bluetooth connection of up to a 164 feet with compatible devices. You also can connect to two devices simultaneously and stream from either one. The Plantronics BackBeat GO 810 headphones are available for around $149, in blue, black, or white. Either way, you can have comfortable extended listening, and still be able to move around without being tethered to your smartphone or tablet. The active noise-canceling is a nice bonus, and without the strong pressure you have felt with older products. 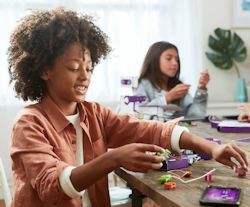 Video cameras are becoming quite popular for do-it-yourself home security, with "smart home" products like the Ring Doorbell cameras and the Blink Indoor and Outdoor cameras (acquired by Amazon at the end of 2017). These are designed to monitor an area, send an alert if they detect activity, and post an associated video clip online. These cameras are designed to be small and inexpensive, and so depend on the web for storage. As a result, they tend to capture relatively short clips, limit the amount of video storage, and/or charge a monthly fee for storing clips for longer periods. They're also not designed for extended live viewing. But these security cameras are great for their purpose, and you can spend lots of time on YouTube watching clips of people who were successfully caught acting badly at front doors -- trying to break in, stealing packages, and hogging all the Halloween candy. Another approach, taken by D-Link, is to build the intelligence and the storage into the camera, with online cloud storage as an option. These cameras detect activity, record clips to a local SD card, send alerts to your smartphone, and optionally upload the video to the cloud. Plus you can monitor them live, continuously, and record while watching, for example to keep an eye out on the driveway for an expected visitor or package delivery. 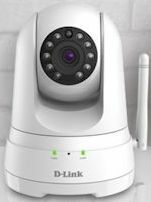 The D-Link cameras also provide a broad range of configuration options, through the mydlink app and web browser access, including remote viewing with zoom, split-screen to monitor multiple cameras, detection sensitivity (sound and/or motion), selecting zones within the view to monitor, alert types, and use of night vision lighting with IR LEDs. The app also works with Amazon Alexa (Fire TV) and Google Assistant (Chromecast). The core D-Link line has four wireless cameras. The base D-Link Mini HD Wi-Fi Camera for $59 (two for $99) is small cylindrical camera (3.6 inches tall) designed for indoor use, and which records only to the cloud. It captures HD 720p video (1280 x 720), with a 120 degree field of view. It alerts on sound or motion, and the night vision IR LEDs illuminate up to 16 feet in complete darkness. The D-Link HD Wi-Fi Camera for $59 is an adjustable camera with similar specs and about the same height, but stores video locally and optionally to the cloud. It also not only records audio with video, but also has a speaker to support two-way conversations. The D-Link Full HD Wi-Fi Camera for $79 then steps up to higher-res 1080p Full HD video (1920 x 1080). It has a wider 130 degree field of view and is a bit taller at 4.3 inches. Finally, there's the D-Link Full HD Pan & Tilt Wi-Fi Camera for $99. This is a 1080p camera with 114 degree field of view. It's a bit chunkier at 4.38 x 5.26 x 4.58 inches, and 0.73 pounds. Plus, it adds the ability to see a much wider area by remotely panning side by side to see behind (170 degrees to each side) and tilting it up and down (up 90 degrees to look straight up and down 20 degrees). The D-Link setup process is relatively painless. You download the app, scan the QR code on the camera to identify it, and then set up the camera on your Wi-Fi network (done transparently through Bluetooth, so you don't need to manually mess around with settings). This worked successfully in most of my tests, although sometimes the app needed to re-try the Wi-Fi setup. Just watch out that there are multiple "mydlink" apps in the app stores (Lite, Home, etc.) -- you need "mydlink" without any modifiers. Finally, D-Link does provide monthly plans for its cloud storage option, which are designed for extending storage for multiple cameras. You can store video for free for 24 hours, with up to 3 cameras. You can extend this to 7 days for $2.49 a month or $24.99 a year, or 14 days with 5 cameras for $4.99 / $44.99, up to 30 days with 10 cameras for $9.99 / $99.99. Smart cloud security cameras are a great inexpensive alternative for alerting on activity in specific areas like the front porch. But for not much more you can get a more flexible camera that allows you to watch areas live, provides more flexible control over how it monitors, and stores and retains video locally without additional monthly costs. The AirSelfie2 Portable HD Flying Camera is a small drone with a build-in forward-facing camera that is designed to make it easy for you to shoot photos and videos of small groups -- especially when there are too many people to shoot with your extended arm or a selfie stick (and you really need a wider and higher angle anyway). This second edition of the product includes two key features from pro drones: auto stabilization, so it can hover in place automatically without you needing to constantly tweak the controls, and auto tracking, so it can lock in on your face and keep you in the view even as you move. Neither of these technologies work perfectly, but they still are quite helpful for making it easier for you to keep it in position while you're trying to set up a shot. In particular, the AirSelfie2 can still drift as it hangs in the air -- typically moving slowly so that it is easy enough to correct with small tweaks, but sometimes and inconsistently worse. The unit is palm-sized and quite small and light, at 3.8 x 2.8 x 0.5 inches and 2.8 ounces. It can be used outside, but really only in controlled conditions without wind. You connect to it using its own built-in Wi-Fi hotspot, which should work to a distance of 65 feet, but a distance of more like 20 feet is recommended. Then use the AirSelfie2 app to control the drone. You first launch it by tossing it gently in the air (from your palm), and land it by descending to your palm or the floor. It has three choices of flight modes, from tapping buttons for each change in motion (move forward/back, move left/right, or rotate left/right -- all while maintain a level orientation), to joystick mode while tilting your smartphone. You also can raise or lower the speed of movement to work better with the environment and your dexterity. The AirSelfie2 uses bottom-facing camera and sonar to control its motion, so the company suggests that it works best in a well-lit environment, over flat and multicolored surfaces, and without sound-absorbing surfaces (rugs). Even so, it can handle flying over furniture and other obstacles of different heights and textures. As you are flying with the AirSelfie2 app, you can monitor the live video from the camera, and tap to shoot photos (or photo sequences) or record video clips. It has a reasonable 12 MP camera with 81 degree field of view, and shoots 1080p HD video (1920 x 1080). The AirSelfie2 flies for around 5 minutes on a charge. The base product is $199, and there also is a PowerBank accessory (bundled with the AirSelfie2 for around $220) that can recharge the unit 20 times in the field for a total flight time of 75 minutes. Depending on your propensity for taking selfies of you and groups, you may not have a compelling need for the AirSelfie2 to capture better selfies. But it sure is fun, and a very promising implementation of advanced flight assists in an inexpensive drone. Entries posted to Manifest Tech Blog in December 2018, listed from oldest to newest.